I was well pleased with CleanseMore it works just a directed take two at night and in the morning magic. 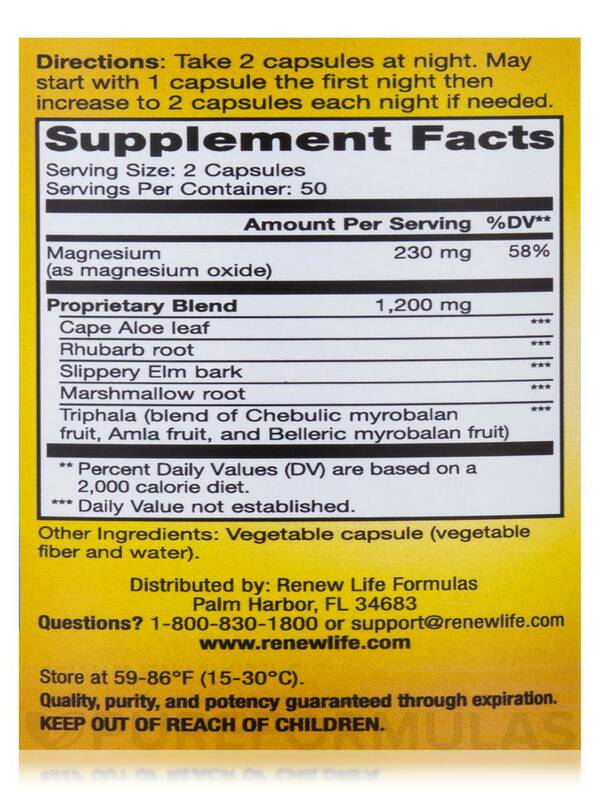 I take two at about 8:00 AM and Cleanse More by ReNew Life works within 12 hours. I no longer have to take Ex-Lax. Promote healthy bowel movement and remove wastes and toxins from your body with CleanseMore™ – 100 Vegetable Capsules from ReNew Life®. This dietary supplement is free of soy‚ dairy‚ corn‚ wheat‚ yeast‚ gluten‚ sugar‚ salt‚ binders‚ fillers‚ and artificial ingredients. Cape aloe or aloe ferox reportedly has high concentration of vitamins‚ minerals‚ fatty acids‚ amino acids‚ saponins‚ and salicylic acid. It could potentially ease respiratory conditions‚ reduce irritable bowel movement‚ and cleanse your colon. Cape aloe may also soothe the tissues of your intestinal tract and boost immunity. Rhubarb root in this dietary supplement from ReNew Life® helps relieve digestive discomfort such as improper bowel movement‚ heartburn‚ stomach pain‚ and bleeding of the gastrointestinal tract. Studies reveal that rhubarb also promotes gallbladder health‚ stimulates bile production‚ and improves digestion. Slippery elm bark reportedly reduces indigestion‚ gastrointestinal inflammation‚ pain‚ and bowel conditions. It may also soothe your throat‚ stomach‚ and intestines. The cooling and soothing properties of marshmallow root could potentially support the health of your digestive system‚ urinary tract‚ skin‚ and hair. Triphala in CleanseMore™ – 100 Vegetable Capsules from ReNew Life® may cleanse your stomach‚ relieve flatulence‚ boost immunity and circulation‚ and detoxify your body. Very gentle. Easy on the stomach. No cramps or pain. 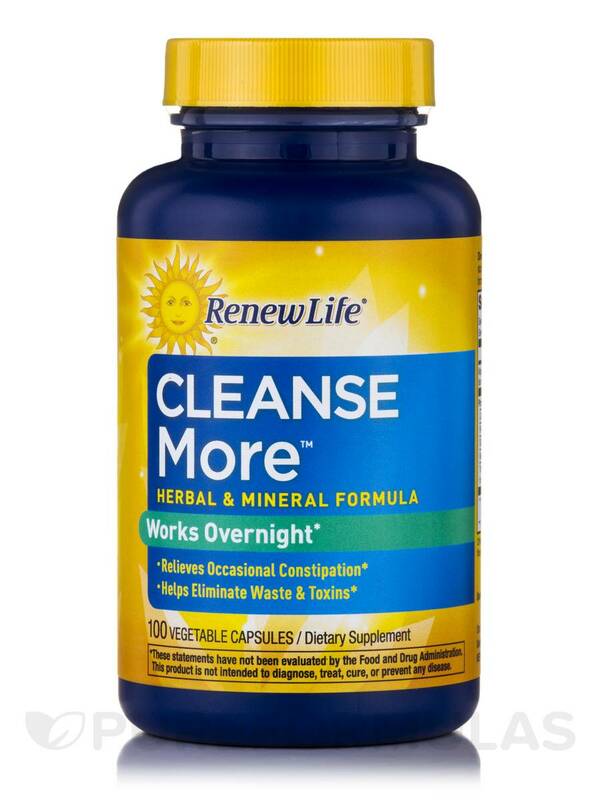 I keep coming back to Cleanse More by ReNew Life because it works without harmful laxatives. A very good company, I've tried a lot of their products. 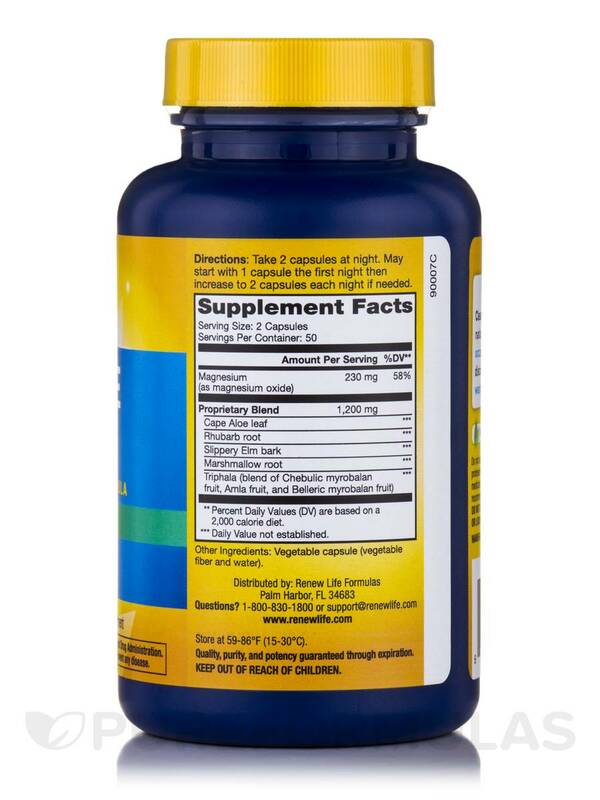 The combination of supportive ingredients without psyllium, fillers or magnesium stearate. Pricier than standard fiber products. I have suffered from IBS-C for over 11 years and the past two years have gotten very bad as I’ve been battling a thyroid issue. I tried many aloe products and singular herbs and nothing has helped until this. I’ve been taking Cleanse More by ReNew Life for 3 weeks now (started with 1 pill/night and now take 2) and I’ve been going to the bathroom 1-2 times almost every day. For someone who was going 1-2/week and getting regular colonics this is great news! Highly recommend! For years I'd use Cleanse More by ReNew Life for a few health conditions, thyroid and constipation have been a big problem for me most of my life. 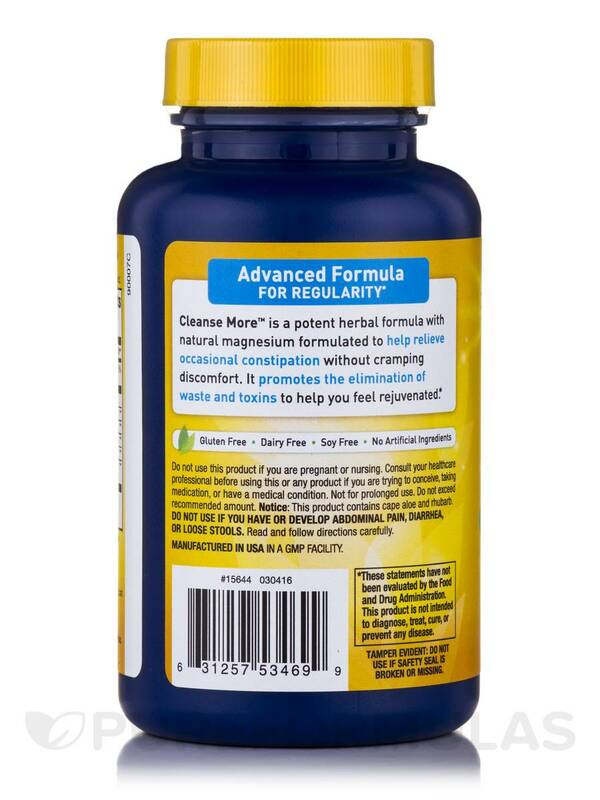 No over the counter formula works better for my than Cleanse More, and I had try many. Doesn't have additives & dangerous chemicals. Its more natural. Fast delivery and it works great! Works great for IBS with constipation. I have IBS with chronic constipation. CleanseMore by ReNew Life is the only product that has ever helped and I have been using it for years with great relief and no cramps. I take one capsule at night. Not exactly what it is recommended for but my doctor found nothing wrong with it. Shipping was very quick and ordering was easy from PureFormulas and their price was lowest. It controls my chronic constipation and IBS without pain and cramping and has done so for years. The cost but it is much cheaper than prescription drugs that did not work. Cleanse More by ReNew Life is gentle and does not cause cramping or urgency. And another plus is that it is not addictive in that your body does not become dependent upon it. It's simply the best, and most pure cleanse I've used. I have used ReNew Life CleanseMore for YEARS!! I occasionally try something else.... and regret it. This keeps things moving very well. When travelling, I take an extra. I will not go without! Wish it was less expensive. 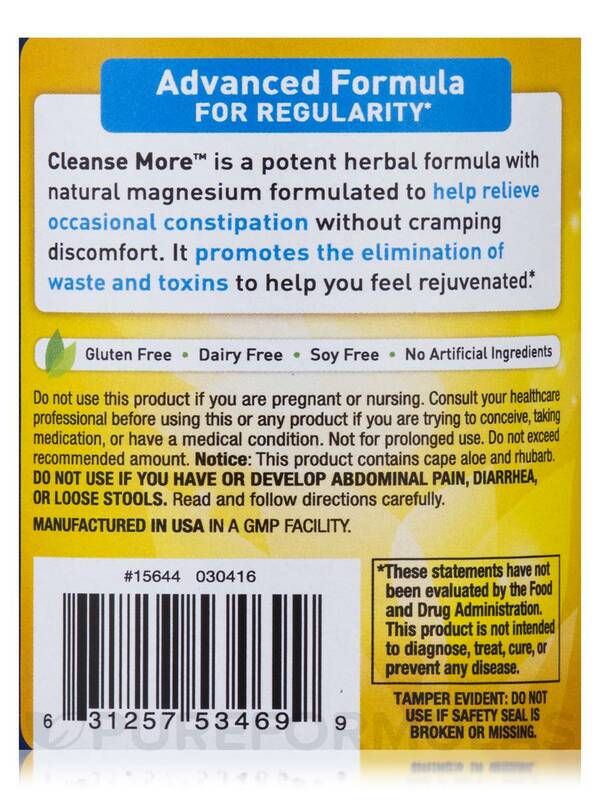 CleanseMore is awesome it works well as a laxative but is not made from stimulant ingredients (including natural stimulants like cascara sagrada). I use CleanseMore daily taking it in the mid-afternoon. I usually order Colon max. Is this the same product?